Article originally published in Adweek June 28, 2018. As online video consumption keeps reaching more mind-boggling measures, visual storytelling is becoming a must in modern advertising and marketing. However, before devising your next cunning video campaign, it’s important to get hitched with a partner in crime whose significance in the delivery of the message and branding altogether is often overlooked. Music in advertising, whether it’s in the form of a chart-topping blockbuster music hit, a carefully composed theme song or mere silence, provides the spark that ignites our emotional engines. Moreover, it hands the audience a dictionary of the emotional context associated with the product, service or cause at hand. Therefore, it is a fundamental element in the overall viewing experience. But don’t take just my word for it! We analyzed the music use of the Cannes Lions award winners in the online video category to point out the role of music as a creator and amplifier of desired moods and emotions. These tactics show just how effectively audio can leverage the emotional impact of a video and—who knows?—maybe win you a Lion, were you to take notes. Over a half of the winning videos featured acoustic instruments. The beautiful piano and violin composition in the Grand Prix winning “The Talk” helps to add an organic and, therefore, real-world layer to the story. It establishes a melancholic soundscape that provides an emotional context from the minds of those who suffer the challenges and hardships in question. Furthermore, instead of choosing to convey the message in a powerful multi-instrumental symphony, the film takes a minimalistic approach, which quite brilliantly personalizes the emotions. This adds a layer of credibility to the overall message that these emotions have a profound effect to people on an individual level. That being said, acoustic instruments don’t get to hog all the human emotions. For example, K Plus’ “Friendshit” commercial cleverly uses synths to evoke an action movie type of tension. The hectic electronic drum machine beat and arpeggiated, monotonic synths underline brilliantly the inner pressures that the main character experiences in her attempts at trying to make new friends. The synth is the most versatile of all instruments as it is able to synthetically reproduce almost every sound out there. In modern electronic music, synths are used to create bass sounds, percussive drum hits, lead melodies and pad sounds, just to name a few. Here, the music and the awkward social interactions between the characters create an intriguing contrast, which serves as the hook from the get-go. In Fitbit’s “First Time” ad from their “Find Your Reason” campaign, the absence of music centralizes all of the audience’s attention to the main character: a person pulling himself into a wheelchair. The simple room ambiance creates a very intimate mood, giving room for the voice-over to tell the story. Audi’s “Ski the World” uses a similar approach, but here the only auditory touchpoint for the viewers’ attention is the sound of skis carving across various landscapes. The laid-back reggae music comes in at the very end to cleverly fortify that their cars maintain driving comfort in different terrains. Would this be so easy to figure out if the music played all the way through the ad? A little over half of the winning ads used the major key in their music exclusively. Major key is commonly associated with cheerful feelings in order to support positive moods. When used together with the minor key, the music introduces the flip side of our emotional coin by pleading to our sentimental emotions. Switching from the major’s carefree tone into the more serious minor key creates a powerful emotional touchpoint and makes the story more relatable. It’s hard to think of a better example than this Harry’s short film “A Man Like You,” in which the music shifts between naive and melancholic tones. The shifts provide an overview of the mind of a young boy who is starting to encounter the challenges of growing up without a father figure. The use of music in advertising and branding purposes goes beyond haphazardly choosing a single tune for a video. Just check the vital role the music played in Apple’s award-winning “Welcome Home” ad. Both visuals and audio should support one another to build a coherent branding strategy. In fact, marketers that rely solely on visuals fail to reach consumers passively watching TV or YouTube, not to mention consumers streaming music online or listening to a radio. The trick, then, is to connect the dots between a brand’s associated set of emotions and music while applying the outcome of this formula consistently. 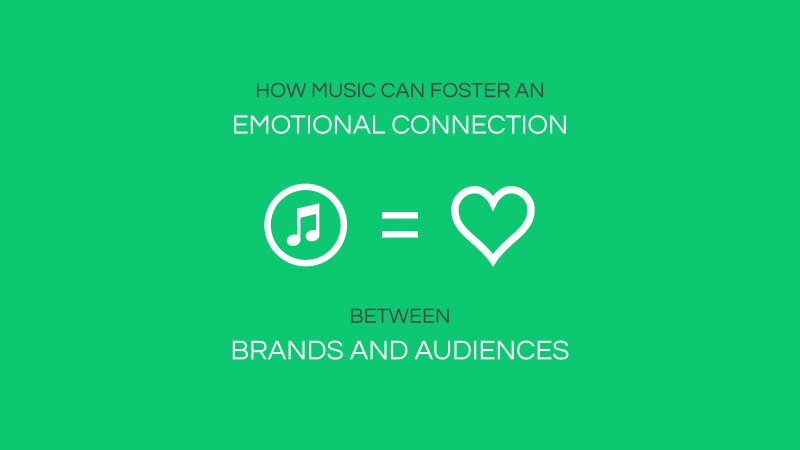 Locating the brand’s emotional framework and its musical translation is the job that falls on the shoulders of audio branding experts.